Malvern, PA (December 15, 2015) – DentalEZ® Integrated Solutions, a supplier of integrated products and services for dental health professionals worldwide, is pleased to offer dental professionals an online Operatory Designer. The Operatory Designer is an online resource that allows users to visualize and personally configure operatories to perfectly match workspace requirements and style preferences. Chairs and Stools–available choices include numerous DentalEZ chair and stool selections and upholstery types with over 40 color possibilities. Dental professionals can choose between Ultraleather™, Ultraleather™ Fusion, Naugahyde®, and NaugaSoft colors. Cabinet Countertops–solid surface countertop designs include twelve different color patterns such as Baja Melange, Crystal Mint, and Bedrock. Cabinet Laminates–options include a wide assortment of hues to coordinate with your countertops and office palette. Floor and Walls–for the backdrop and floor of the operatory, dental professionals can choose from six wall, and eleven wood or tile floor shades that set the stage for a pleasant operatory experience. Users of the Operatory Designer begin with a blank operatory canvas and have the option to personalize each and every operatory component. Moreover, operatory designs can be saved, downloaded, printed, or emailed to share with colleagues or a personal DentalEZ territory sales member to make the virtual operatory a reality. 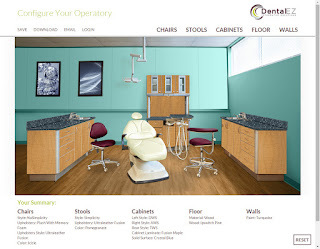 To try the new Operatory Designer, please visit operatory.dentalez.com. DentalEZ® is committed to advancing the practice of dentistry through fully integrated products and services. Encompassing five distinct product categories—StarDental®, DentalEZ®, RAMVAC®, NevinLabs™, and Columbia Dentoform®—DentalEZ® manufactures everything in the operatory, from handpieces to chairs to vacuum systems to dental simulation models, creating a complete line of products to elevate the health, comfort, and efficiency of the dental operatory. For more information, please visit www.dentalez.com. I've Been Ranked One of the Top 20 Dentist Blogs! Why Do Hoverboards Keep Blowing Up?